Our caring staff can assist you in making sure your pet has the required vaccinations. Feel free to contact us to address any questions or concerns you may have regarding your pet’s care. At Valley Vetco we genuinely care about the wellness of your pet. 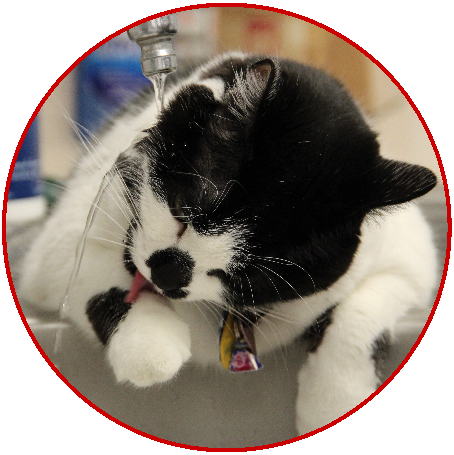 Our primary care veterinary clinic has serviced Albuquerque and the surrounding areas since 1987. We believe that by offering low cost preventative services we can save pet owners money today and in the future. We offer a host of various preventative care services like low cost vaccinations, microchipping, heartworm testing, nail trimming, and wellness exams during any of our open business hours; without an appointment. We also provide affordable services such as spaying, neutering and declawing: with a scheduled appointment. We believe that the wellness of your pet is dependent on your education of your pet’s health, as well as proactive prevention of the many conditions that can affect our small family members. 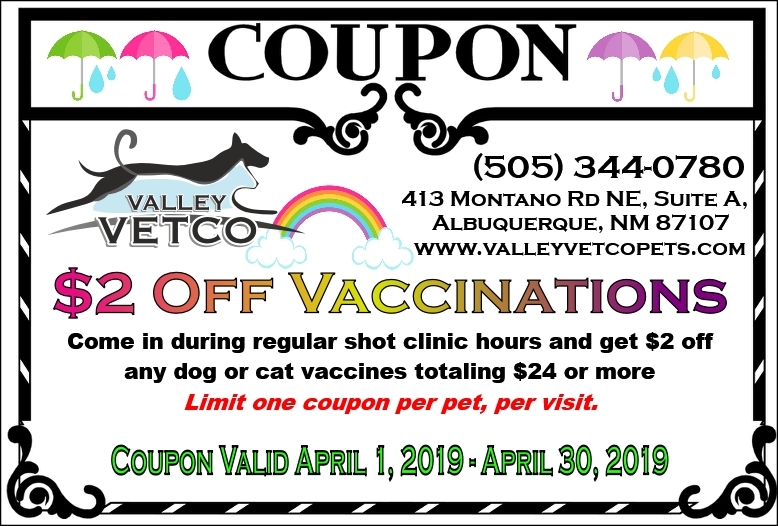 At Valley Vetco, we specialize in low cost vaccinations and sterilizations with no income qualifications necessary. Everyone gets the same low prices! 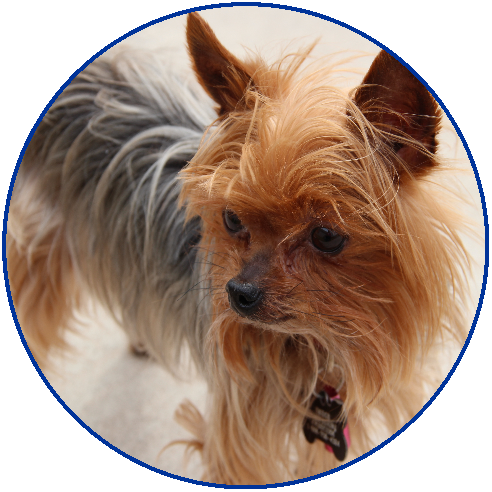 We do not charge office visits for services such as vaccinations, microchipping, nail trims or heartworm testing. These services are all available during any of our open business hours. This provides a huge savings over what full service clinics charge for these routine services. We do not perform X-rays, lab work, or euthanasia. We also offer affordable spaying and neutering surgeries 4 days a week, by appointment only. Our price list speaks for itself. Any pet owner would love the gift of free services for their pet. Gift certificates are available for purchase in any amount. 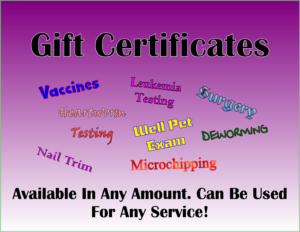 Certificates can be used toward any of our services, and are the perfect gift for someone with a new furry friend. Come in during any of our open business hours to purchase. Spring has sprung! Time for evening walks, trips to the groomers, and play dates. Are your pets up to date on vaccinations? It’s important to protect your pets from communicable diseases. Cats should be vaccinated against feline distemper, leukemia, and rabies. Indoor kitties can be exposed to these diseases as well if an outdoor cat comes to your screened in porch or window. Dogs should be vaccinated against parvovirus, distemper, and rabies. Your dog can be exposed to some of these diseases just by taking a walk, or even being in their own yard. Dogs coming up to your fence may not be vaccinated and infect your pet. 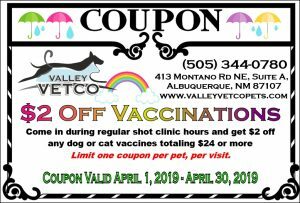 Present this coupon at time of service to get $2.00 Off any dog or cat vaccines totaling $24.00 or more. No appointment. Just come in anytime we are open! LIMIT ONE COUPON PER PET. COUPON VALID 4/1/19 – 4/30/19. We accept digital coupons as well as printed. Just show us our coupon displayed on your mobile device. We are committed to promoting responsible pet ownership, preventative health care and health-related educational opportunities for pet owners. 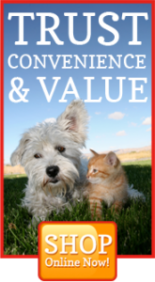 Valley Vetco strives to offer excellence in veterinary care to Albuquerque, NM and surrounding areas.